"Ethelbert Ernest Daish was the son of the Rev. Joseph Henry Daish and his wife Ruth, nee Fife. The Daish side of the family originated from the Isle of Wight, however Ethelbert was born in Parramatta, New South Wales, Australia, on 11th October 1870 where his father was doing missionary work. The family returned to England around 1876, and Ernest subsequently trained as a grocer on the Isle of Wight, from 1887 to 1890. In 1904 he married Margaret Hannah Gentle at Newport, Isle of Wight. They then lived at Bridport, St. Albans, and Whaley Bridge. They had three children, two girls and a boy. In 1914, at the outbreak of the First World War, Ethelbert joined the Royal Navy as a Petty Officer. In 1918 his wife died and the family returned to the island. In 1919 he was on a hospital ship as part of the North Russia Expeditionary Force during which he wrote an account of the trip, transcribed on this site. My mother could remember Ethelbert (her father) sending a letter, from Russia, written on the bark of a tree. He also brought back with him a bear fur and a pair of muffs made out of squirrel fur. In 1920 he remarried to Lillian Barratt and continued in the retail trade in Newport. During his life he was also a local Methodist lay preacher, hence his accounts of some of the Russian churches, and perhaps the apparent abstinence of alcohol! Ethelbert died at Newport on the 27th January 1958, aged 87. 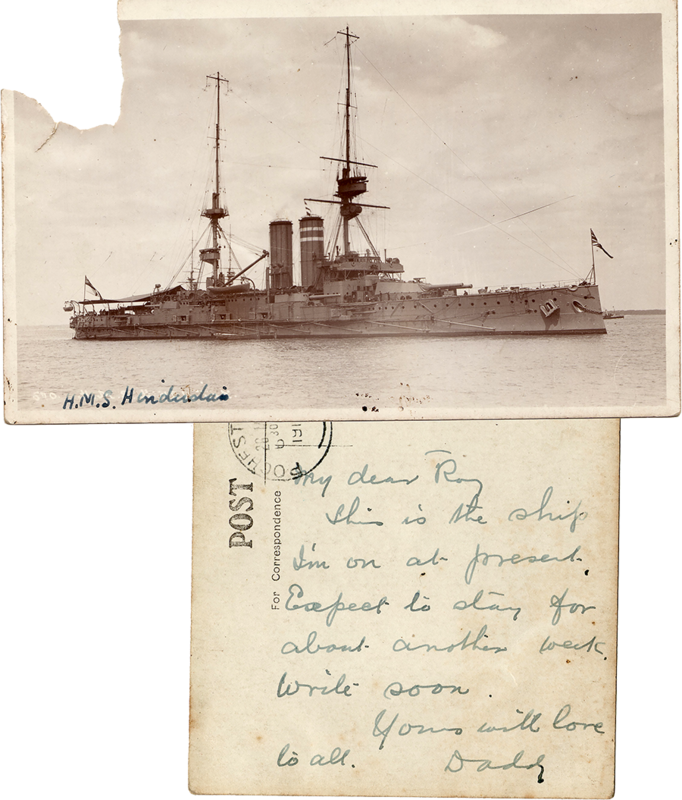 ⁓ Addressed to Master Roy Daish, c/o Mrs Gentle, 27 High Street, Newport, Isle of Wight.